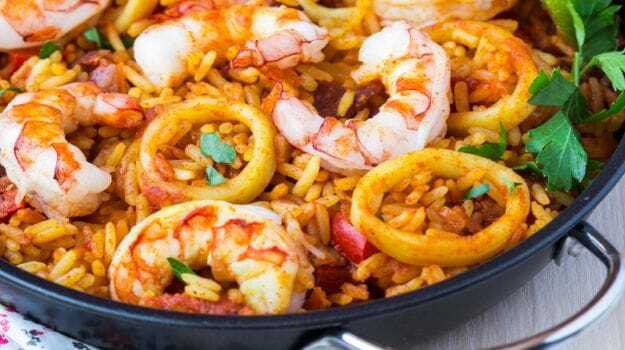 Is Paella the Dish That Best Connects Spain with India? My friend Harshad’s parents, Mr. and Mrs. Rajadhyaksha, went to Spain on a holiday recently. They were keen to explore the country but were worried about the food there. So they went on a group tour which provided Indian meals through the trip. Packages like this are popular among folks who want to discover new places but prefer the familiarity of home food. While in Spain, Harshad’s parents wanted to try out at least one local meal. So the group went and spoke to the tour manager who agreed that their next meal would be Spanish. Sure enough, the next day when they came down to dinner, they saw that the daily butter chicken, dum aloo, dal tadka, jeera rice, roti and gulab jamun weren’t there. Instead they were served a yellow coloured rice with prawns and chicken in it. “Just like a pulao,” said Harshad’s mother, who cooks quite a lovely Malvani prawn masala herself to go with a Maharashtrian masala bhaat (a sort of spicy pulao). What they had been served infact, was a paella (pronounced: pa-ee-aa). 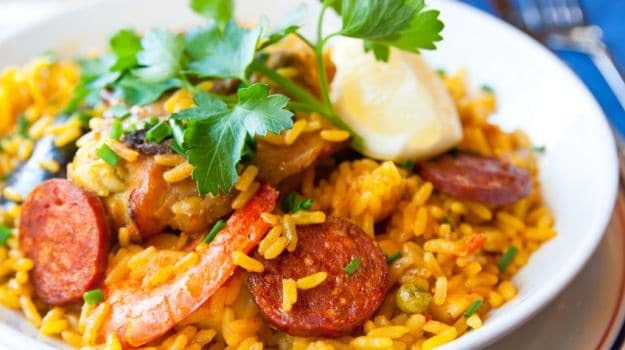 Paella to the Spanish, is what tandoori chicken is to India, sushi to Japan and pasta to Italy. The one dish that sums up a diverse national cuisine to the rest of the world. 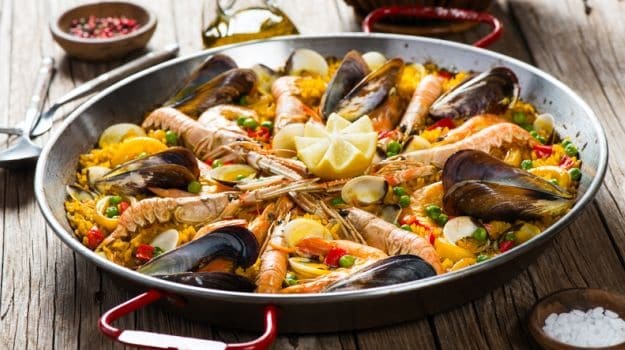 Of course, the Spanish will tell you that there is a lot more to Spanish cuisine (at times I prefer the gambas pil pil, croquettes and Jamon Iberico to the paella myself) than the paella. They will also tell you that paella is a dish that belongs to Valencia in Spain and is more regional than a ‘National’ Dish. Passions evoked by paella in Spain can be compared with those generated by biryani in India. The Valencians believe that only their paella is genuine just as those in Hyderabad believe that only theirs is the ‘authentic’ biryani or just as Kunal Vijayakar often declares that only the Bombay biryani is the real biryani and just as I will tell you that the biryani only came into its own in Calcutta when potatoes were added to it. Just as there are debates on whether there should be potatoes in biryani or whether such a thing as chicken, let alone vegetarian, biryani exists, there are long debates in Spain on whether peas should feature in a paella or whether it should be a seafood only dish or a mixed (seafood and meat) dish or a meat dish with no seafood! My first taste of a paella in Spain (I had had it in Mumbai’s Bandra before) was in the Mercado San Miguel food market in Madrid which would be the equivalent of going to Dilli Haat to try out Assamese food. My closest brush with a Valencian paella was when I was invited by the Spanish Government to Barcelona to give a talk on ‘promoting tourism through social media’ at the Casa Asia Conference. Guillermo Marinez, my contact point, from Casa Asia took me to a restaurant on the beach called L’Escamarla for paella post the conference. Guillermo is from Valencia and told me that the paella at the restaurant was the closest to what he enjoyed back home. The paella at L’escamarla had this incredible buttery feel in the mouth which came from the starchy rice and this, along with the flavour packed goodness of fresh seafood such as prawns, squids, and mussel, elevated the dish to an operatic experience. Served on the side, was some garlic pureed aioli to give a more rustic flavour. Guillermo, though from Valencia, didn’t seem to have a problem with the fact that the paella had seafood in it. 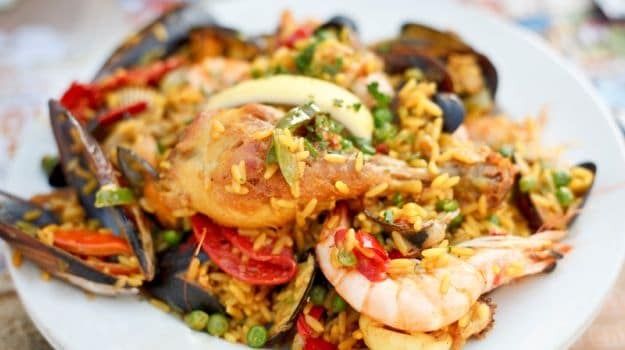 Outside of Spain, paella is usually associated with seafood but what is the original paella all about? Should it have seafood or not? I put this question to Carmen Pauline Rios Benton. Carmen and her father had taken me on a food trail in Barcelona earlier where we visited her father’s favourite haunts from his growing up years. Carmen told me that paella was originally a farmer’s dish so it was unlikely that it would have had seafood in it. She pointed out that it represents the paradigm of a Mediterranean diet: olive oil, cereal vegetables, pulses and a small amount of animal protein to ensure that it is a healthy and balanced dish. Suprio Bose who works with the Catalan Government, and is a food blogger too, connected me with Ms. Marisol who is from a small town called Nules, 50 km from Valencia. She was extremely emphatic that a paella should NOT have seafood. She’s grown up having paella. Paella is made every Sunday at her house, through the year. ‘Sunday is family day,’ said Marisol. According to her, the key ingredients of a paella are chicken, rabbit, pork ribs, Jewish artichokes, red pepper, kidney beans, tomato, garlic, olive oil and salt. So I turned to Shawn Hennessey who runs the Sevilla Tapas tours and had taken us on a fantastic tapas trail in Sevilla. She said that discussion on paella can turn pretty controversial in Valencia. There will be folks who will say that paella with any seafood or onions is not ‘authentic’. According to them, rabbit and/ or chicken, flatbeans, garlic, tomato and saffron are key. Yet, she once met a chef from Valencia who said that anything made in a paella pan can be called paella! Though the majority agreed on the ‘original’ paella not being a seafood dish, my search for a definitive answer still remained inconclusive. The fact that the paella is a rice based dish and is flavoured with saffron, is what makes it familiar to our Indian palate and which is perhaps why Harshad’s parents liked it so much. The texture of the rice is a bit different from what we are used to, as it is not pre-soaked in water before cooking, unlike in India. The rice is added at the end, which gives it a bit of a bite. However, the high starch content in the rice and the seafood and meat broth in which it is cooked, gives it a buttery after taste. In a traditional paella, you could get some crunchy bits of rice. This is called soccarat, which like the tahdig in the pilafs of Persia, refers to the burnt bits of rice scraped from the bottom of the flat pan in which the paella is cooked and is much sought after. People often jokingly say that risotto is almost an Italian khichdi but if you ask me, it is actually the paella which is closer to our Indian food, viz the pulao, with its saffron base. The pulao was brought into India by the Mughals and then morphed into the biryani as many food historians will tell you. The paella too has a Muslim origin, as the growth of rice in Valencia is ascribed to the Arab rule of the province. However, it is said to have started as a common people’s dish, unlike the pilaf or pulao which was more of a royal dish. There is another way in which that a paella connects Spain and India. Unlike in Northern European countries, which are more individualistic, in Spain people get together as a family to share meals just as we traditionally do in India. 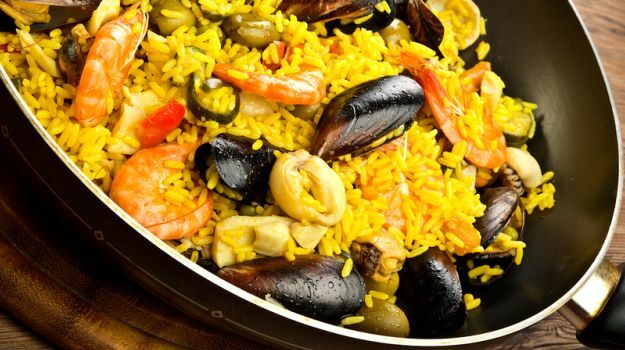 Paella is a dish which is always meant to be enjoyed in a large group. Unless you are a food pilgrim, chances of your going to Valencia on your first Spanish trip is low. There’s plenty else to see in the country, what with Alhambra, gothic churches, olive farms and cities like Madrid and Seville. You do get paella in restaurants across Spain of course, just as you will get a Hyderabadi biryani in Chandigarh or in Goa. In most restaurants, menus will point out that paella servings are for at least two people. This is because there is a certain minimum size to the flat pans in which paella is cooked (which is a bummer if you are alone). The word paella is said to have come from the Latin word for pan (patella). Back to whether paella should ideally have seafood or chicken, it may have crossed your mind if there can be a vegetarian paella too. On another trip to Barcelona, I was invited home for a Sunday lunch by Manel Casonovas, who was the Director of Gastronomy for Barcelona Tourism. “This is personal and not official, you come and we will cook together,” Manel told me on the phone. I jumped at this opportunity, especially as Manel is a trained chef too. I reached his apartment on the following Sunday afternoon and Manel tossed me an apron and we began to fry ham and cheese croquettes together. “I have made a vegetarian paella as my elder daughter has turned vegetarian,” said Manel from the kitchen, when I took a break and shared some wine and fresh mussels and clams with his charming wife and daughters on the patio. Out came a beaming Manel with a large paella pan. The rice was artistically decorated with large prawns with tails and heads intact! Be very very specific about what you mean when you tell someone in Spain that you want vegetarian food. Lines may be a bit blurred there. Kalyan loves to eat and he loves to talk about all that he eats. His wife urged him to start writing about it, otherwise she would have to hear it all. He blogs as ‘finelychopped’ and is the editor at large for the India Food Network. According to a 2016 report published by Indian Cuisine RR, Kalyan has also been rated as ‘top Indian food influencer on Twitter’. FoodIs Paella the Dish That Best Connects Spain with India?